But how does one go about formulating a way out of war when at its heart lies the very real and intricate issue of legitimacy? If Yemen’s conflict is great many things: competing geopolitical ambitions, access to natural resources, hegemony and so on, it also needs to be looked at as the socio-political compounding of political currents running counter to each other – as far at least as each party has conceptualised power and legitimacy. Caught in between two powerful wills – that of the Resistance and Saudi Arabia’s monarchical system, Yemen has become a pawn in a war which tribal nature has been either dismissed as irrelevant, or overlooked out of ignorance of the region’s socio-political history. Maybe more to the point, Yemen’s war has been made to fit a western narrative – thus divorcing facts from their true context. Labelled the unruly child of Southern Arabia for it has always resisted Saudi Arabia’s ‘assimilation’ agenda, Yemen came to pay the ultimate price for its rebellion … or resistance depending how one chooses to look at the situation. Yemen’s war proper exists well beyond the military – at its core, this war on Yemen is a battle aimed at reforming the way we rationalise nations’ sovereignty and territorial integrity within the axiom of exceptionalism. Armed of the power conferred by the United Nations Resolution 2216, Saudi Arabia has rationalised military interventionism by arguing political consensus – or at least the mirage of one; thus positioning itself as the legitimate expression of an overarching power: that of the United Nations. As the saying goes – the Devil truly lies in the details. War I fear was not what the UN inferred when it referenced “any additional measures” to its list of sanctions. And indeed that would have been to extend capital punishment to all Yemenis to pressure a handful few into compliance. Riyadh had another view – one tainted by the belief that the kingdom, by the sheer strength of its finances, political friendships, and self-proclaimed religious sanctity over the Islamic world ought to break to its will all countries within its radius of influence. Yemen as far as Al Saud was concerned was not about to assert its independence. If readers care to cast their mind back to 2011 they will see how Riyadh bore heavy on Yemen’s Revolution, and how manipulative all GCC countries were in orchestrating a transition of power that would secure their interests over that of the wishes of all Yemenis. There is a certain irony to Yemen’s transition of power since it was left to the GCC countries to first formulate its democratic premise, if we consider that all, without exception exist in authoritarianism with a deplorable human rights track record to boot. Like I wrote earlier on: the emperor has no clothes. Saudi Arabia has based its entire rationale on former President Abdul-Rabbo Mansour Hadi’s institutional and political legitimacy; making the case for his return in power on the back of the Houthis’ aggressive takeover. The argument has no leg to stand on by the nature of Hadi’s appointment and the delimitation of his presidential mandate. Allow me to take you back to 2012 when Hadi – formerly Yemen’s vice president under Ali Abdullah Saleh’s regime, was made to run in a one-man presidential election, under the patronage of the GCC countries and the blessing of the United Nations. If the international community hailed the move a democratic victory, many within Yemen sneered at the democratic parody. With no voice to oppose his rise to the presidency, there was ever little need for a presidential election – nevermind the ‘nerve-racking’ counting of the votes. But Yemen went along with it to seal once and for all former President Saleh’s era. Hadi’s mandate demanded that he facilitates Yemen’s constitutional reforms by way of a National Dialogue Conference – where all political and tribal parties would come together to define Yemen’s institutional future. To accomplish such task Hadi was given two years … not a minute more. 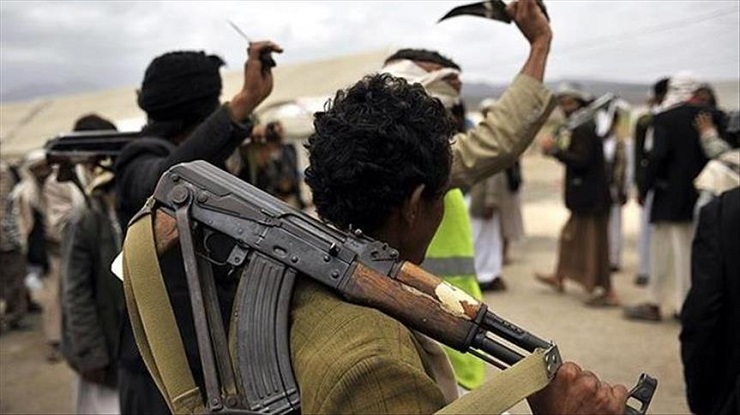 Began Yemen’s tortuous road to a popular consensus. When consensus was reached and an agreement drawn then-President Hadi decided to go off script, prompting the ire of several parties, among which his own: The General People’s Congress and Ansarallah. The UN’s special envoy for Yemen, Jamal Benomar, described the conclusion of the National Dialogue Conference as a “historic moment”. “After being on the brink of civil war, Yemenis negotiated an agreement for peaceful change, the only such in the region,” he said. “The National Dialogue established a new social contract and opened a new page in the history of Yemen, breaking from the past and paving the way for democratic governance founded on the rule of law, human rights and equal citizenship,” he added. Only Saudi Arabia was not so keen on the idea of equality before the law and democratic governance when it meant having what it sees as ‘infidels’ roaming south of its borders. Riyadh’s distaste for Yemen’s Shia population is hardly a secret. To see such communities empowered both socially and politically when the kingdom spent decades oppressing them by promoting the rise of Salafism/Wahhabism within Yemen’s ruling elite did not exactly sit right with Al Saud. As he reneged on the terms of his presidential mandate, Hadi faced a popular uprising which found itself a flag bearer in the Ansarallah movement – headed by Seyed Abdel Malek Al Houthi. With no political backing to speak of and an increasingly angry population hungry for a new constitution Hadi took to the air to announce his resignation. It is now January 2015. In truth it was Hadi’s resignation which prompted Ansarallah to assume de facto power over Yemen. If not for the vacuum Hadi had created Yemen would look very different indeed. But as it is often the case, we find that facts and truths are but tools in the hands of historians. He, who hold the pen, will ultimately write History according to his will. Hadi lost all legitimacy … however one wishes to look at it, the second he handed his resignation. He further drove that message home when he chose exile over shouldering his responsibilities. Resolution 2216 may call for sanctions against now deceased President Saleh and the Houthi leadership but, and by no stretch of the imagination, does it confer Saudi Arabia the right of life or death over Yemen. 26 million Yemenis face famine, and millions have been killed, injured and/or displaced since late March 2015. UN humanitarian chief, Mark Lowcock, already warned that by the time an imminent famine is confirmed, it would be too late to stop it. Accelerating economic collapse has caused prices of staples to increase by 30% at a time many millions of Yemenis were already finding it hard to feed their families. “One of the things about what happens in famines is there’s a sudden collapse of which you get no notice … When the collapse happens, it’s too late to do anything. There’s a huge loss of life very, very quickly. So that’s the issue we’re flagging,” Lowcock stressed in an interview with the Guardian. Saudi Arabia’s argument for war no longer holds … I personally believe it never did. Former President no longer holds any card to his name, and time has de facto legitimised Ansarallah leadership through popular consensus. And thought such facts may vex Riyadh and several western capitals, a political upset cannot serve as a legitimate basis for war, not if we believe in such principles as territorial integrity and nation’s sovereignty. By denying Yemen the right to political self-determination we are dissolving the very pillars of international law, thus threatening our democracies and our rights.